What goes into organic milk? While it’s somewhat easy to understand what goes into (or doesn’t go into) organic vegetables, milk is another story. Turns out that it’s more than just the feed given to dairy cows. The US Department of Agriculture (USDA) regulates the use of organic of product labels. Only milk that is 100% organic can be labeled as such. 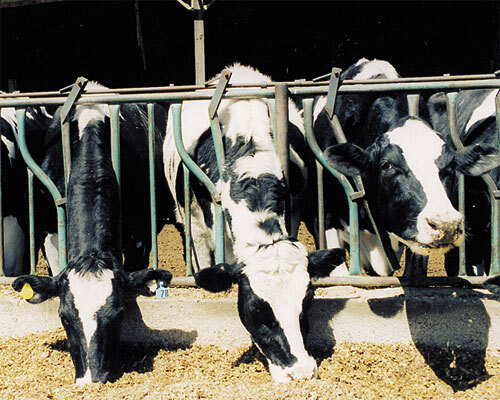 No use of GMO crops for feed or bedding. No Antibiotics may be used in the production of organic milk. Organic farmers are not allowed to withhold medical treatment from an animal but it must be sold as a conventional animal after administering prohibited substances such as antibiotics. No synthetic fertilizers or minerals that have been treated in a environmentally unsustainable way. No hormones may be given to cattle. Oxytocin was allowed in the past for treatment of calving issues but I believe it may be prohibited now. No feeding of animal byproducts such as bloodmeal or tallow. The stipulation that dairy cows not be given GMO crops for feed or bedding is curious considering the USDA’s recent move to deregulate genetically modified alfalfa—dairy cows are usually fed a mixture of grains with alfalfa hay. If the USDA decision holds (it is currently being contested), it will be interesting to see how the organic milk market responds. The rigorous requirements that go into organic milk may help make it more nutritious than conventional milk. Back in January, a UK study suggested that organic milk contains higher levels of polyunsaturated fats. The study behind this coverage has analysed the fat content in 22 brands of milk available in UK supermarkets, including 10 organic brands. It found that, overall, organic milk contained significantly higher levels of polyunsaturated fats, which are thought to be beneficial for health. However, there was no difference in overall levels of saturated fat, so suggestions that the study found organic milk to be “less fatty” were inaccurate. There were also seasonal variations in the differences, which were more pronounced in the summer, and other differences likely to be linked to the quality of the cows’ food. There you have it. Organic milk is somewhat complex, but it seems to have some nutritional benefits over conventional milk.